Exciting news: We’ve launched events.offerzen.com! 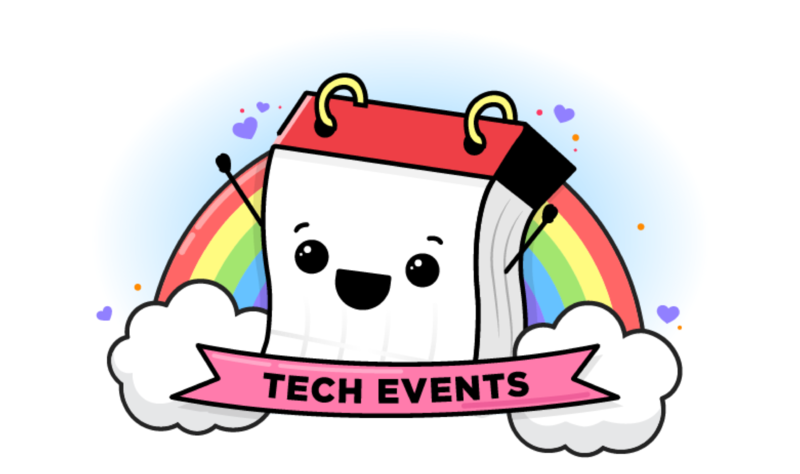 It’s a curated schedule of the best local tech events and speakers. OfferZen’s mission has always been to support the South African tech community. Apart from helping people get great jobs, we also actively engage and contribute - by giving away cool T-shirts, social media, blog posts or attending local meetups. One-on-one interactions with people in the tech industry are invaluable to help us get better at what we do. That’s why we attended a lot of meetups! Finding the most important meetups shouldn’t be that hard, right? Initially, it wasn’t. I just went for the most obvious solution and used meetup.com to see where South Africa’s tech community met. But amongst all the suggested events Meetup kept sending me (like salsa and meditation classes), I found it quite hard to keep track of the events that were actually relevant to my mission. Cater primarily for developers or people who work on software dev teams. Are active i.e. have hosted meetups 4+ times in the past year. Or are new and trying hard to build their community. In the past months, our events team has been establishing relationships with people who are trying to build better, more actively involved communities in the software dev space. 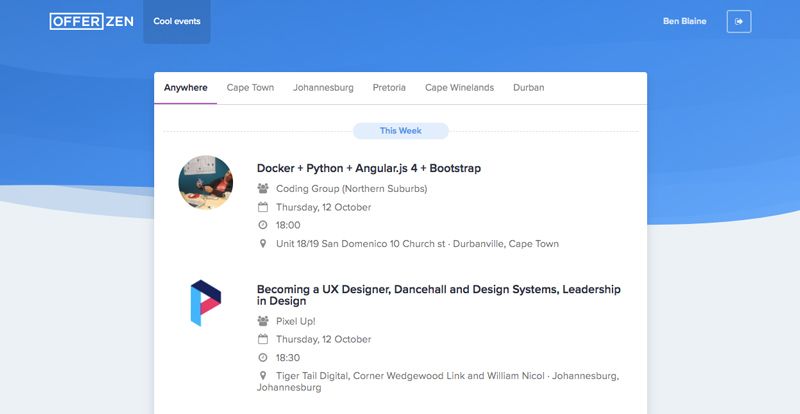 In addition to attending and sponsoring meetups around South Africa, we also started running our own events: We did a hackathon with OfferZen’s programmable bank card Root, an insuretech hackathon and multiple #hackyourcareer events aimed at helping university students who are into programming prepare to begin looking for their first job. 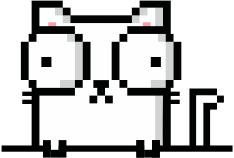 Getting so heavily involved in the community meant that our Google Sheet quickly became too much to manage: So I spent a Saturday getting to grips with and configuring this cool Ruby gem called Almanack that creates a feed based on meetup.com. This enabled me to hack together an “upcoming events page”. The idea was to get something up with minimal effort that we could improve later on. It was a super useful tool for us because it gave us a great overview of how active the communities are, helped us to prep for upcoming events and avoid scheduling conflicts. After speaking to various event organisers throughout my adventures it became apparent that the site would be useful to them and the community as whole, so we decided to open it for public participation and consumption. However, the hacked page was again becoming unmanagable and had weird limitations which meant I needed to keep creating workarounds. For instance, I had to create four different meetup accounts to cycle through API keys so that I didn’t hit limits on their API. At this point, I realized that we needed to get a real dev involved in our mission and build something scalable. We now use meetup.com’s OAuth so that organisers can apply to sync their existing group with OfferZen’s feed once and all future events that they create on meetup.com automagically appear on the event feed. We personally review each application based on the original criteria we had. 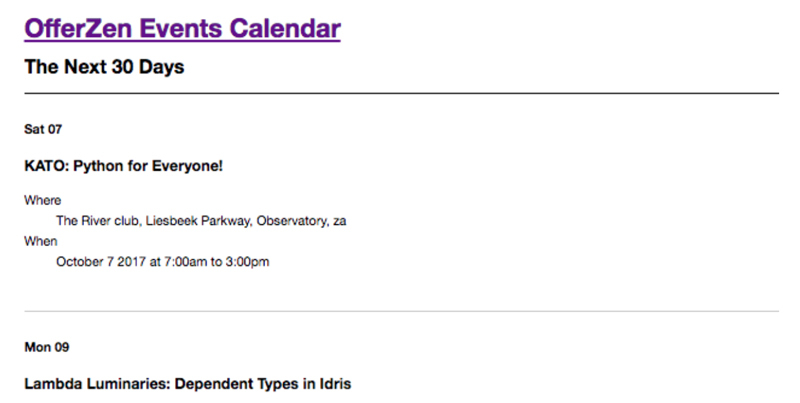 We’re hoping it will help SA’s tech event organisers build better, more actively involved communities. We’re busy building more features based on feedback from the community - so please send ideas and feedback to ben@offerzen.com.